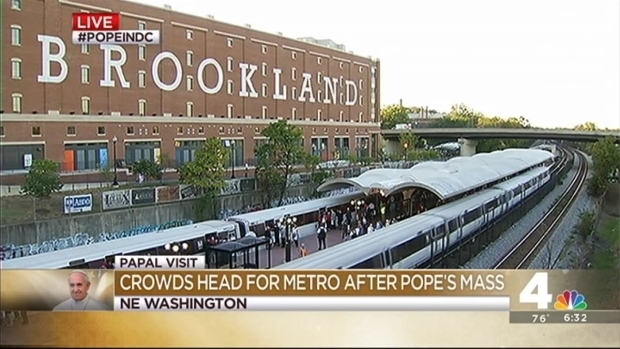 Riders can exit and enter the Brookland station again after Metrorail moved the crowd following the Mass of canonization of Junipero Serra at the Basilica of the National Shrine of the Immaculate Conception. Metro switched the Brookland station to entrance-only and outbound-only following the papal mass, and a large line formed at the escalator closest to the basilica. People trying to exit the Metro system could use the Rhode Island Avenue or Fort Totten stations instead, Metro said, and shuttle buses were available. Earlier, the station became exit-only Wednesday afternoon when a massive crowd arrived. More than 20,000 attended the ticket-only Mass at the basilica at Catholic University of America. The Brookland station is the smallest on the Red Line. At maximum capacity it can accomodate 10,000 people per hour. 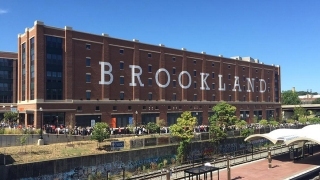 About 14,000 people used Metro to get to the Brookland station Wednesday, compared to 6,000 on a typical day. Mark Segraves reports. About 14,000 people used Metro to get to Brookland Wednesday, compared to 6,000 on a typical day. Metro officials announced in advance of the pope's visit that some Metro stations might become exit-only or enter-only depending on crowds. Wednesday is the pope's busiest day in town. However, as of noon Wednesday, overall Metro ridership was running lighter than a typical weekday. 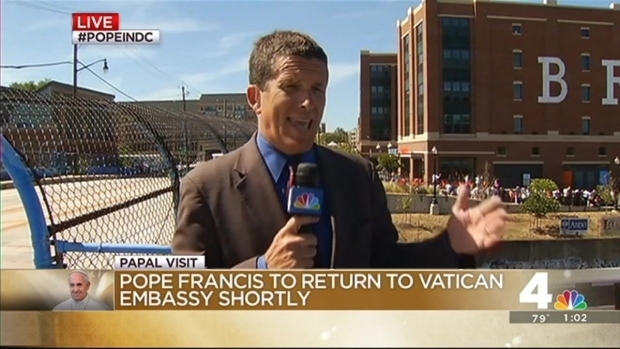 Many government workers were encouraged to telework in advance of the three-day papal visit. At Metro Center, crowds were light at midday and trains were running frequently. By noon, ridership was down 26 percent compared to the same time last Wednesday. Fewer than 220,500 trips had been taken by that time, WMATA said. Late Wednesday morning, only a handful of Metro parking lots were at a capacity of 50 percent or greater, with just one, Rhode Island Avenue, full at 10:30 a.m. Parking lots at two other stations were nearly full at that time: Fort Totten and East Falls Church. Hours before Pope Francis' Mass of canonization of Junipero Serra, long lines formed at security gates near the basilica. Mark Segraves reports. However, Metro usage is expected to increase significantly later Wednesday. A massive crowd lined the Ellipse as Pope Francis traveled in a parade there around 11 a.m. Those attendees had to be in place early in the morning, but many were leaving the area at the same time when the parade ended around 11:30 a.m.